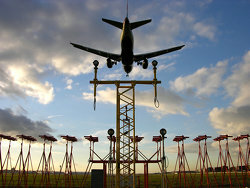 Major Uk Airports, Airport Accommodation in England, Scotland, Wales & Ireland. UK Airport Hotels. Air travel springs to mind mainly as a method of getting into and out of Britain for travellers, but those planning longer journeys within the country should consider whether the plane is an option too; likewise those travelling to the many islands off our shores. The prime benefit of taking flights is of course speed, though don't rule out rail - centre to centre it is hard to beat Eurostar between London and Paris for example. In assessing the economics of booking flights over using the car or train, factor in the saving on hotels and food if you save an overnight stay. In the age of low-cost carriers it doesn't follow the plane will be more expensive: book early on the likes of Ryanair, Easyjet and Flybe and you can get some real bargains - likewise if you have the nerve to wait for the last minute to snap up a cheap seat. And in spite of the best efforts of Ryanair, there is still a certain cachet about air travel; a lingering hint of Imperial Airways and ladies in floaty dresses sipping champagne. In planning a trip don't limit your thinking to the major hubs like Heathrow, Manchester and Glasgow: there are more than 50 airports in Britain, Northern Ireland and nearby dependent islands, so potentially a flight could replace a long car, coach or rail journey, or that plus one or more ferries. The following is a list of places with airports with scheduled flights, though some of them have very limited services and the list changes regularly - check in advance of travel, this may already be inaccurate! If possible book early, you may secure bargain tickets. If you are flexible and have the nerve, last-minute tickets likewise can be cheap - if there are any. When using low-cost airlines, remember there is no such thing as a free lunch - eat before you fly. Check your luggage allowance and keep to it: excess baggage is very expensive. If you have a heavy coat or boots - wear them; and put your book in your pocket. To travel to and from the airport, don't limit thinking to taxis: National Express has some services direct to terminals; several airports (like Heathrow and Manchester) have their own train stations; most have local buses; and an arrangement with friends or family can be best of all. Ferries are a great way to island hop in Scotland, but planes may be quicker and sometimes more convenient; but don't bank on daily services. If you want to take your own car to the airport, look for off-site parking services or book in advance with on-site car parks; and don't forget you are driving when you get back - lay off the in-flight drinks if you are. Don't be one of those annoying people who hold up the plane because they can't drag themselves from the bar; the rest of us loathe you, and you will get no refund if your luggage is offloaded and you miss the flight. Before you fly make sure you are not carrying stuff that will be confiscated at security: scissors, pen-knives, liquids beyond minimal quantities etc. If you expect to be hungry on the flight, buy chocolate or sweets before you travel; the airport will be dear; the flight dearer still.